Everybody knows that Tim Allen, Martin Lawrence, and John Travolta make nothing but bad movies lately. But why did they have to drag William H. Macy into their fold? 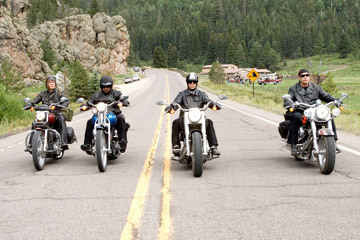 The quartet band together in Wild Hogs, a seriously unfunny look at four middle-aged men who go on a road trip to try to reclaim their youth. Allen (The Santa Clause 3, Zoom) is a dentist whose son ignores him, Lawrence (Open Season, Big Momma's House 2) is a husband afraid to stand up to his nagging wife, Travolta (Be Cool, Ladder 49) is recently divorced from his swimsuit model wife, but none of his friends know, and Macy (Everyone's Hero, Bobby) is a shy computer programmer. Aside from these superficial qualities, there is nothing deep or interesting about these men. The movie gives them "cute" little set-ups to show why they need this road trip. The two running jokes in Brad Copeland's script are that Dudley Frank (Macy) cannot ride a motorcycle and that the four men are not gay. Sounds like a classic movie in the making. 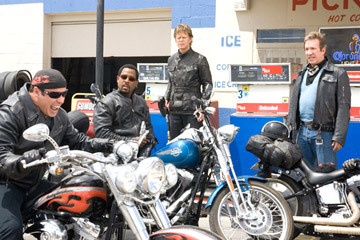 The four are long time friends, and decide to take a motorcycle ride to the Pacific. "No plans" is the mantra - they just want to enjoy their freedom. Director Walt Becker (Buying the Cow, Van Wilder) wants this to be a lighthearted, wacky trip with the expected heartwarming moments at the end, but everything is just so stupid and lowbrow, giving Wild Hogs a lame feeling. To throw in some conflict, the movie gives these guys the Del Fuegos, a Hell's Angels like biker club led by Jack (Ray Liotta, Smokin' Aces, Take the Lead) that terrorizes the local population and treats the friends like posers. After a confrontation that ends badly, Woody Stevens (Travolta) wants them to get on their way as soon as possible. Frank, Doug Madsen (Allen), and Bobby Davis (Lawrence) cannot figure out why Woody, who wanted to see the sights, is in a rush all of a sudden. They stop in a small town called Madrid (where they spell chili both with an "i" and an "e") where Dudley meets a cute waitress named Maggie (Marisa Tomei, Factotum, Marilyn Hotchkiss Ballroom Dancing & Charm School). The Del Fuegos are also the bane of Madrid, whose townsfolk life in fear of the bikers. There really is no secret where Wild Hogs is heading. Becker and Copeland sew together a plot strung together with cliches and overacting. One gay joke is enough, but when Becker adds a character whose only purpose is to chase the guys and comment on them, it gets tiring fast. On another note, Both Woody and Doug make it a point to go riding without their helmets. Not only is Wild Hogs unfunny, but it's also irresponsible. 1 hour, 39 minutes, Rated PG-13 for crude and sexual content, and some violence.